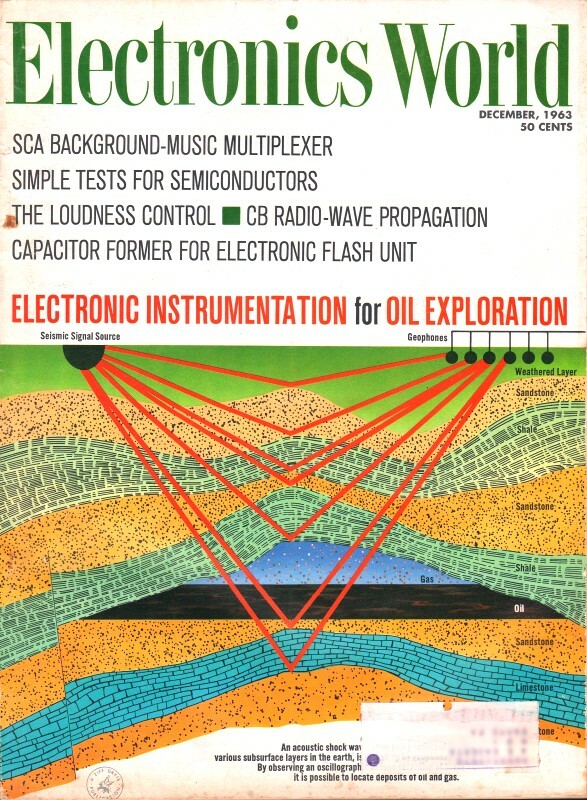 It seems the title, "Mac's Radio Service Shop" for John Frye's tech tales might have been dropped after Radio & Television News magazine changed its name to Electronics World in May of 1959. The characters' names and roles were all the same, but the title was dropped - probably to not bias the new theme of the magazine. This episode discusses some of the strange ways in which a faulty bypass capacitor can manifest itself. A big part of effective troubleshooting is the experience of 'having seem that before.' Interestingly, by 1963 vacuum tubes were still in common use, but printed wiring boards had been introduced, along with their propensity for developing broken traces. Also mentioned is why having a safety ground on a metal chassis is essential (a rare feature in 1963), and what is probably the first mention of the newfangled Thomas & Betts 'Ty-Rap' nylon ties that are now used for everything from bundling wires to securing packaged items for shipping to handcuffing perps. Technical curiosity can reap some satisfying rewards even when it just involves solving a case with freak symptoms. "I guess this knocks the props from under those fur-on-the-wooly-worms forecasters who said we wouldn't see any cold weather until after the first of the year," Barney remarked as he hung up his heavy coat and started rubbing his half-frozen ears. "It took me twenty minutes to get my car started this morning." "Here's just the thing to warm you up," Mac suggested, sliding a playing little radio down the bench toward his assistant. "It's one of your jobs that bounced. The owner admits it now takes longer for the noise to start up after the set is turned on than it did before; but once it starts, it's just as bad as ever. The ticket says you replaced a noisy 12BE6 tube." "I remember that set, and I'll swear the 12BE6 was bad!" Barney exclaimed. "It was one of those jobs in which you could trigger the noise on or off by flipping the envelope of the tube with your finger nail. After I put in a new tube, no amount of jarring produced any noise; so I made out the bill-"
He was interrupted by a great crackling, frying sound from the little receiver. Quickly he removed the back and struck each tube in turn with a tube tapper. The noise was unaffected. "Guess it must be a bad i.f. transformer," he hazarded, reluctantly starting to pull the flimsy printed-circuit chassis from the case. But when the noise-testing probes of the signal tracer were placed across each winding and between the windings of the i.f. transformers, there was no indication of defective coils or of leakage from coil to coil through the plastic in which the coil-tuning capacitors were embedded. Similar tests revealed nothing wrong with the oscillator coil. Even when Barney tried gently flexing the printed circuit board to see if a break in a printed circuit lead might be causing the trouble, the noise kept merrily grinding away. Mac, who was aligning a receiver on his end of the bench, noticed the noise from Barney's receiver was heard almost as loudly in the set he was aligning. When Barney's set was turned off, the noise disappeared from Mac's set. "Whatever is causing that noise must be pretty close circuit-wise to where the line enters the set," Mac suggested; "otherwise it wouldn't be feeding back into the line so strongly. Try removing the capacitor that connects directly across the input when the set is turned on." Barney did, and instantly the noise disappeared. When the capacitor was returned to the circuit, the noise returned. A new capacitor produced no noise. "That's a new one on me," Barney admitted. "The defective capacitor feels pretty warm. It must have an intermittent high-resistance leakage path through the dielectric. Probably lightning caused it. The erratic leakage current doesn't start until the capacitor reaches a certain temperature. That's why I didn't catch it before. I was looking for one, not two, sources of noise. Having found the noisy tube, I looked no further." "I can't honestly criticize you too much this time," Mac admitted. "I had that set playing a good forty-five minutes before you came in, and it was as quiet as you could wish. Furthermore, I can't remember seeing more than two or three cases like that in all the years I've been servicing, It's not uncommon to find a line bypass that makes an intermittent noise when it is tapped simply because the poor connection between foil and lead is disturbed by the vibration; but this capacitor was soldered firmly to the printed circuit, and vibrating it had no effect whatever. The leakage path is inside the capacitor. Ordinarily the heavy line current follows across any leakage path there and literally blows the capacitor apart. Let the defective capacitor cool down, and then we'll run some checks on it as we gradually warm it up with a lamp. I'd like to know what's peculiar about it." "I used to think I got all the odd-ball cases," Barney remarked; "but the other day I was talking to a technician over at the parts store, and he came up with a really wild tale. A man who lives at the edge of Cantorville to the west of here was sitting on his front porch one evening last fall watching a neighbor's dog frisking about the yard. The dog happened to brush against a downspout that came down alongside the porch, and immediately let out a howl of anguish and went yelping for home as hard as it could lope. The man walked over to the downspout to investigate, and when he touched it he was almost knocked flat by an electric charge. "He called the electric company, and the electrician found a full 120-volts a.c. between the downspout and ground; yet neither spouting nor eavestroughs came anywhere near any wiring about the house. The electrician methodically began pulling fuses and he soon discovered one line in the house that killed the charge when its fuse was pulled. Next he unplugged things from that line one at a time, and when he unplugged the TV set, the charge on the downspout was gone. "The electrician suggested a TV technician be called to see what was wrong with the set, and that's where my friend came in. It didn't take him long to discover lightning had shorted a line bypass capacitor between the hot side of the line and the chassis. When this was replaced, the charge disappeared from the downspout, and the receiver seemed to work normally. It was supper time when the job was completed; so my friend packed up his tools and left. "But that night he couldn't sleep. He lay awake trying to figure out how on earth the 120-volt a.c. was getting from the TV chassis to the downspout. He reasoned it must have something to do with the owner-installed TV antenna, for he had noticed on the diagram that the center-tap of the antenna coil was grounded to the chassis and that there were no capacitors in the antenna leads. What's more, the antenna mast had not been grounded. But the closest the antenna lead came to the downspout or eavestrough was right where the lead went through the wall and connected to a lightning arrester; and that arrester was at least a foot away from the downspout, and both were fastened securely to the painted wooden siding. "The next morning he went back to the house and asked permission to do some more investigating on his own time. To simulate previous conditions, he disconnected the antenna lead from the receiver and connected it to the hot side of the a.c. line through a 10,000-ohm resistor. Sure enough, the voltmeter revealed almost 120 volts on the downspout. Looking very closely at the lightning arrester, my friend thought he saw a faint dark line beneath the paint going over to a metal clamp that held the downspout. When he carefully scraped away a bit of the paint, he revealed a carbonized path burned right into the wood leading from the arrester to the clamp. Checks with an ohmmeter revealed only thirty ohms resistance in this path. When the arrester was replaced with a new one mounted at a slightly different spot on the siding, the downspout was cool as a cucumber. What's more, TV reception was improved because signal pickup by the eavestrough and down spouting fed into one side of the lead-in had been messing up the directivity of the antenna. "My friend reasons the same flash of lightning that knocked out the line bypass must have jumped from the arrester to the downspout and burned the carbonized path into the wood. Possibly lead in the paint smeared over the case of the arrester made this jump easier. Anyway, my friend claims he slept like a baby the next night." Mac nodded in agreement. "I know exactly how he felt, and I like this friend of yours. He has that most important characteristic of a good technician, a good engineer, or a good scientist: technical curiosity; and he's not afraid to spend time and effort, with no prospect of immediate monetary return, to satisfy it. You used the phrase 'on his own time' to describe the investigation your friend made into the puzzling case of the hot downspout. In my book, every technician worth his salt puts out a lot of effort 'on his own time' in his daily work. When he encounters a puzzling situation in his servicing, he's not content with merely restoring the set to operation through lucky accident. For his own peace of mind he must try to find out why the defective component made the receiver behave the way it did, if there was any reason for the failure of the component that could be corrected, and if there was any best way to pinpoint the trouble should it be encountered again." "Yeah, but aren't you going to be griping because I'm not turning out sets instead of educating myself at your expense?" "Have I ever criticized you for following through on a puzzling service job? It's not that I'm just interested in seeing you satisfy your curiosity. I know that each time you do this you improve yourself as a technician, and a really smart and alert technician is worth three times as much to me as a half-baked one capable of doing routine servicing and nothing more. You don't get smart by doing service work mechanically. You have to think and to wonder and to check and to double-check until you know. Out of this knowledge comes diagnoses that are quicker, surer, and more accurate." Mac had been replacing an FP filter capacitor with an under-the-chassis cartridge type as he talked. After all the unanchored connections were carefully taped, he bundled the leads together and wrapped some sort of flexible white strap around them and cut off the excess length. "Hey, what you doing there?" Barney demanded. "I'm using a 'Ty-Rap' manufactured by the Thomas & Betts Company of Elizabeth, New Jersey, to hold the wires in place," Mac answered, tossing one of the objects to Barney. "As you can see, it's sort of a long, flat needle of nylon shaped something like an old-fashioned cut nail. There's an 'eye' running crossways in the flat head, and a piece of metal is embedded in this eye so that when the tapered tail of the 'Ty-Rap' is threaded through the eye and pulled tight around a bunch of wires, the loop is locked solidly in place and the excess tail can be snipped off with the diagonal cutters. "They are used in cabling in place of lacing. They come in a wide variety of shapes and sizes. Some of them have provision for fastening each unit to a chassis or board after it has been wrapped around the wires. In addition to these hand-installed units that I think will be most useful in our work, there is another group designed to be installed with a tool that pulls the 'Ty-Rap' tight around a bunch of wires, locks it in place, and snips off the tail all in one operation. These would be fine in production, but I believe the hand-installed units will come in quite handy for us in making neater auto-radio, custom hi-fi, and other installations where keeping wires fastened securely together and out of sight adds to the appearance." "It sure beats taping wires together," Barney agreed.